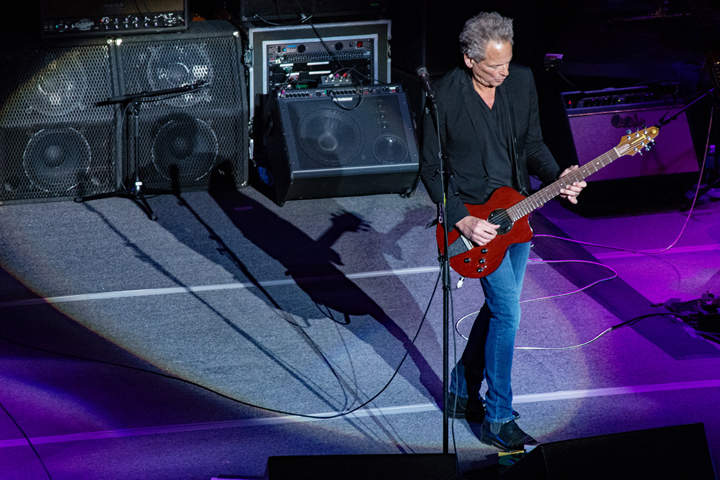 Although Lindsey Buckingham’s show at the Warner Theatre on October 19 wasn’t quite sold out, those in attendance showered love and support for Fleetwood Mac’s former singer, songwriter and lead guitarist extraordinaire. Performing songs from a catalog going back 35 years, both from solo work as well as his days with Fleetwood Mac, Buckingham turned in a stellar and moving performance. The concert opened quickly with “Don’t Look Down,” “Go Insane” and “Surrender in the Rain.” But soon enough, Buckingham addressed the matter on everybody’s mind: his recent, and untimely, ousting from Fleetwood Mac, saying slyly “one of the reasons” for this tour was because Warner Brothers had asked him to put together a compilation of his solo work. Most fans are now well aware of the controversial and acrimonious aspects of Buckingham’s departure from his former band, but he was in a generous and contemplative mood, saying the situation should be viewed with compassion. For the man who wrote, arguably, the angriest break-up song ever, “Go Your Own Way,” I found Buckingham’s philosophical attitude revealing, and something to aspire to. Addressing the break-up early on may also have been Buckingham’s way of getting the “unpleasantness,” out of the way so we could concentrate on the music. After years of performing, Buckingham is an expert at pacing a concert. The first third of the 22-song set was generally fast-paced, up-tempo material culminating with the mega-hit, “Trouble,” from his 1981 debut solo album Law and Order. The concert’s middle section began with a few solo acoustic numbers before seguing back to lesser known, quirkier pop tunes, including the evening’s first Fleetwood Mac songs. The slower music demonstrated the breadth and width of Buckingham’s songwriting abilities. Contrasting light melody “Slow Dancing,” with the stunning, deep and dark “Street of Dreams,” the artist’s songwriting mastery was obvious. “Tusk,” signaled the final third of the performance, its heavy percussion urging the audience to its feet. The Fleetwood Mac slow-burner “I’m So Afraid,” climaxed in a jaw-dropping Buckingham guitar solo. He has a truly unique guitar playing style that uses a combination of finger picking and strumming to perform his solos, a technique that affords incredible range, versatility and intensity. The finale, “Go Your Own Way,” with its incredible guitar solo, was the one song many of us, including me, was there to hear, and it was awesome. Wish I had been there...he put's on a wonderful show! Well, his house is up for grabs for 26 million....anyone wanna pitch in?